In addition to my interest in learning, professional development, instructional design, and football(! ), I also read a lot of economics and political/social sciences. What I’ve been intrigued to note lately is the confluence of some good economic thinking with the latest trends in learning. Yes, really! 1. Actions lead thoughts, behaviors lead learning. Traditional thinking states that you need to teach adults what they need to know for their jobs, which leads to better performance. That notion is being challenged on many fronts. In fact, both research and practice is showing that guiding actions, providing tools and freeing people to experiment leads to learning in more impactful ways than traditional training and instruction. Learning by doing, or Action Learning, is not a new idea, but it is one that is gaining renewed relevance. Learning: See Jane Hart and Avi Singer, where they (as many others have) point out that learning is the work, and that the ability to extract meaning from tasks, learn from coworkers through collaboration and cooperation, and document what is learned is usually a more powerful learning experience than formal training and professional development courses. 2. Openness and collaboration trump safeguards and secrets. Allowing actions to lead learning requires an openness to allow the learning process to occur, even as the work unfolds. If management can overcome that mental hurdle, a treasure of potential may be realized. 3. Deliberate, programmatic supports for learning are key. Far from being a call for laissez-faire policies, organizations and societies that can create the structures to nurture systemic learning will thrive in the 21st century. It may on the surface appear as if I’m recommending soft management to allow people to run down any hunch or notion as they wish. While the freedom to explore – and fail—is important, this calls for deliberate structures and new managerial approaches to work well. Building silos and setting rules is easier than guiding and mentoring adaptation, and begs for more innovative managerial skills. Learning: As Harold Jarche rightly points out, the managerial skill needed for modern work is the ability manage complexities, not hierarchies. 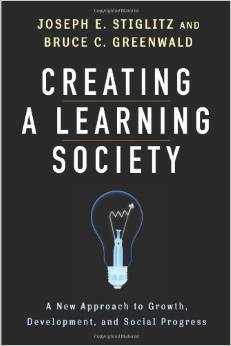 Economy: Joseph Stiglitz and Bruce Greenwald recently published Creating a Learning Society: A New Approach to Growth, Development, and Social Progress. While my M.A. is in Political Science, and I took some economics classes at university, I don’t pretend to understand all the economic mathematical modeling in the book. However, his points are so relevant, and pros so lucid, that even I got a lot out of reading it. For a useful distillation of Stiglit’z core ideas, see his accompanying short article from June of this year. So what’s the insight here? The ways in which our world is increasingly based around dispersed networks rather than hierarchies is changing the way we work–which is to say, learn. 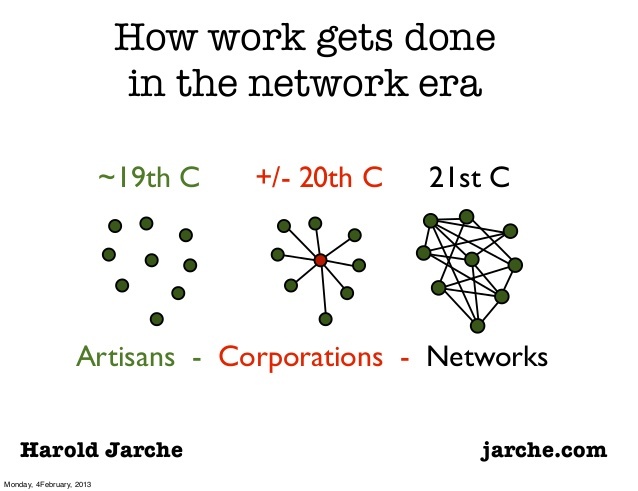 On the macro-economic level, for the organizations in which we work, and in our increasing responsibility for our own learning and professional development, we’re relying on network-based relationships where nexuses of knowledge and various levels of association are as shifting as our conditions and motivations of the moment. If you’re reading this, you are part of exactly what I’m describing. I’m glad to have your open association and welcome your thoughts.